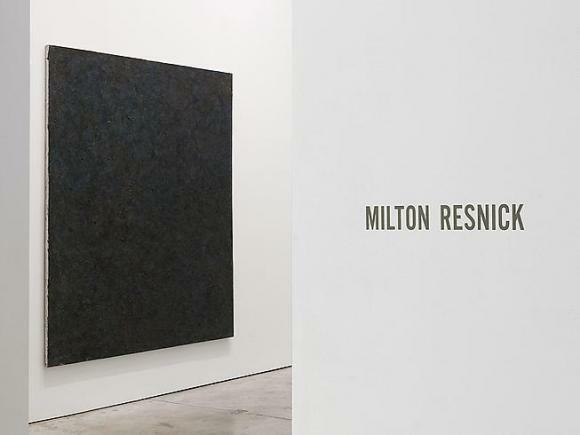 Cheim & Read is pleased to announce an exhibition of paintings by the late Milton Resnick. The gallery has been the exclusive representative of the artist’s estate since 2006. Cheim & Read’s previous exhibition of Resnick’s paintings was in 2008 and focused on works from 1959-1963. This show looks to later works from the 1960s to the 80s. It is accompanied by a full color catalogue with an essay by Philip Larratt-Smith. The essay, “Play Dead,” combines art historical analysis with juxtapositions of texts and images from film, literature, and history. Born in Bratslav, Ukraine in 1917, Milton Resnick immigrated to the United States with his family in 1922, escaping the civil war of his homeland. In 1933, he left his studies in commercial art at Pratt Institute and transferred to the American Artists School in order to focus on painting; he graduated in 1937. From 1940 -1945, Resnick served in the US Army, returning to New York at the rise of Abstract Expressionism. As part of the first generation of the New York School, Resnick has long been admired as a “painter’s painter,” his thickly layered canvases originating from a purist notion of paint itself. Upon his death in 2004, Resnick was qualified as the “last Abstract Expressionist painter” (Roberta Smith). Though his later work eclipsed more traditional notions of Abstract Expressionism, he remained fiercely committed to the tenets of non-representational painting. As evidenced in this exhibition, he denied the infiltration of image or illusion, and strived to distill abstraction to its very essence, championing an “all-over” approach to the canvas. As Larratt-Smith argues, Resnick was fundamentally anarchist, refusing hierarchy and authority in painting as well as in life. The same intensity was applied to his work; he once described his painting as a “defiant act.” Later paintings are especially indicative of this – the massive, heavily-impastoed, near-monochrome canvases are impenetrably dense, refusing entry or prescribed “meaning.” Yet, in their focus on negation, Resnick’s works acquire a visceral duality. Unyielding surfaces become reflective, almost luminous. For the patient viewer, his paintings are transcendent.